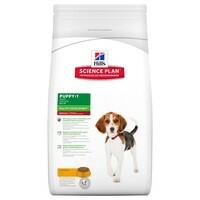 Hills Science Plan Healthy Development Medium Puppy Food is a nutritionally complete diet for puppies to give them the best start in life. Made with high-quality ingredients with precisely balanced nutrition for gentle, healthy digestion, Hills Puppy Food has primarily been developed to support healthy brain, eye and skeletal development. Hills Puppy Food also contains clinically proven antioxidants to support and promote a healthy immune system.